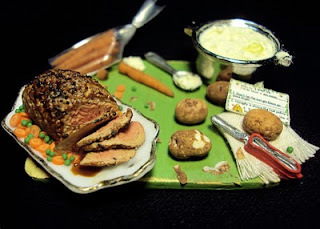 Kimberly of Kimmi Lou Miniatures makes the most exquisite 12th scale food. 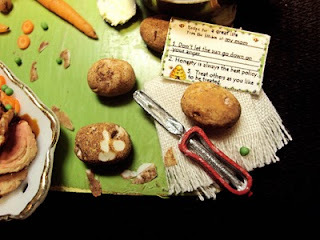 Here Kimberly explains that the board in the photos has all the makings of a yummy Sunday dinner, complete with a recipe for her mom's "recipe for life!" A perfectly done roast, creamy mashed potatoes, and sliced cooked carrots and peas all ready to place on the table for dinner!